I don't usually post a lot of DIY projects or tutorials in this space, but I've been spending a lot of time trying to get my world a bit more organized as of late. So, I thought I'd share! This whiteboard calendar is super simple to create and—I'm telling you—it has made juggling multiple freelance projects and editorial calendars much more manageable! The first step is deciding how many weeks you want to display and whether or not you want to display the month. 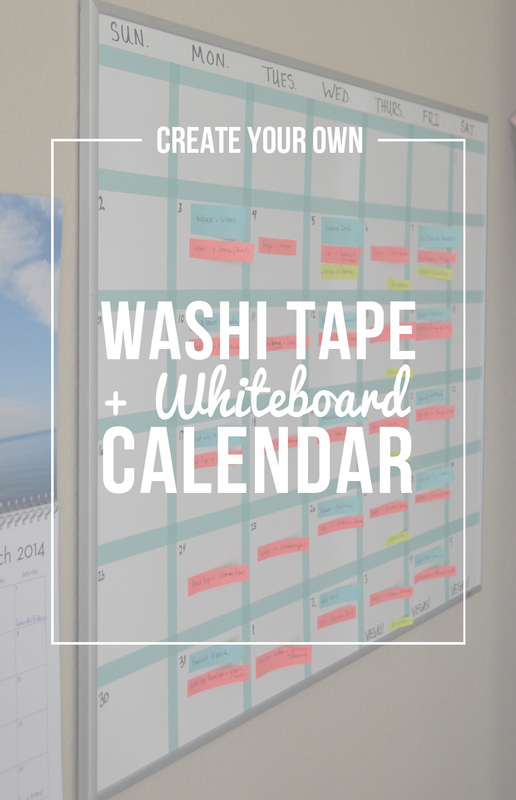 If you plan to have more than one whiteboard, you may want to build in a small area to note the month as it will help you see everything with a quick glance. Since I knew I'd only have room for one large whiteboard calendar, I decided to leave out the month and add in extra spaces so I could show the first week or so of the following month. So, I broke the board into seven rows—one tiny row to display the days of the week at the top and six larger rows to account for each week I wanted to display—and seven equally-sized columns for each day of the week. Once you've decided, just get to measuring and taping! Many whiteboards come with a warning against using adhesives (like tape and post-its) on the surface, but I knew I'd be using the whiteboard specifically for this purpose and didn't see an issue with it. You will want to follow the hanging instructions that come with the whiteboard, however. You don't want all of your hard work to come tumbling down! I've been using this system in conjunction with my google calendar (I've decided that I'm no good at using paper monthly planners) to manage my crazy list of deadlines, meetings, appointments, travel schedules and editorial calendars for the last several months and it's been great. I will say it can be overwhelming to have this bird's-eye view of 30-40 days worth of stuff, but overall it's been working for me. So, what type of organization system do you use to stay on task and on schedule? How is it already APRIL?! Whew... time really does fly, doesn't it? In keeping with my announcement about a few changes coming to this space starting this month, I'll be changing up my monthly wallpaper posts to focus less on my goals and more on the wallpaper itself. Writing out my personal goals and hearing what you all have in the works has been incredibly worthwhile, but I'm finding that when it comes to goals, I need to stop writing and start doing. Have you ever felt that way? So instead, I'm simply offering up a photo from a local lavender farm to help spruce up your desktop—industrious bee included! Blooming lavender is a sight I can't wait to see more of as the weather begins to warm. I hope you enjoy the free download and welcome to April, my friends!